From violence you save me. 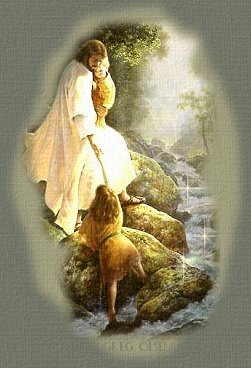 "Lord, if it is you," Peter replied, "tell me to come to you on the water." Then Peter got down out of the boat, walked on the water and came towards Jesus. But when he saw the wind, he was afraid and, beginning to sink, cried out, "Lord, save me!" And when they climbed into the boat, the wind died down. Then those who were in the boat worshipped him, saying, "Truly you are the Son of God." Spiritual struggles [or temptations] consist of constantly recurring feelings of despair about whether we can be saved. At first these feelings are mild; but as time goes on they weigh heavily on us, until finally we doubt and almost deny God's presence and the possibility that God will help us. When we experience inner struggles, our spiritual life is usually brought to these dire straits, since in this way our materialistic life is snuffed out. For when we are in the throes of despair, the Lord keeps the deepest parts of us actively engaged in the fight against false ideas. Because of this, our despair is dispelled soon afterwards by the comfort that the Lord then gives us. All spiritual struggles are followed by comfort and the renewal of our life. A preacher's job, it has been said, is to comfort the afflicted . . . and afflict the comfortable. In this church, we do a fair amount of afflicting the comfortable. The First Order of Service, which we follow on most Sundays, is a service of repentance--of recognizing our faults, our shortcomings, our misbehaviors (our "sins" in traditional religious language), and pledging to overcome them with the Lord's help. In other words, our First Order of Service is one designed to afflict us and prod us toward personal reformation, lest we become too comfortable with the way we are right now. And as Patty has pointed out to me more than once, the evils of selfishness and materialism take a beating quite often in my sermons! The fact is, by material standards, most of us are quite comfortable. Oh, we may struggle with the bills each month; we do not consider ourselves wealthy. Sometimes we have a severe financial crunch and have to give up things that we have become accustomed to. But few of us have experienced real, ongoing hunger or homelessness--and if we have, it was probably many decades ago. We have grown used to having food on the table, a roof over our heads, and clothes on our backs. This is a good thing! I am not among those who believe that as a rule, poverty is good for the soul. Perhaps in some cases a bout with poverty may help to humble us and focus us on what is really important in life. But I do not believe that God intends us to endure grinding poverty and a constant struggle just to keep body and soul together. Poverty, I believe, is a human invention, brought about by our unwillingness as individuals, as a society, and as a race, to consider the rights and the needs of others to be just as important as our rights and our own needs. If the Golden Rule were in force, there would be no poverty. Most of us have managed to eliminate poverty from our own lives, thanks partly to the fact that we live in a wealthy and largely law-abiding nation, and partly to an awful lot of hard work! We do have our material worries, but compared to hundreds of millions of people in our world who really do experience poverty as the regular circumstance of their lives, we are relatively secure in our material circumstances. It is easy to get complacent in that security. It is easy to lose sight of the deeper dimensions of life--to "eat and drink, for tomorrow we die" (Isaiah 22:13). But the Lord has created this universe in such a way that our complacency is usually shattered by circumstances. Just when we think our life is in pretty good shape, we experience a setback or a shattering blow. We lose our job; we lose our best friend, our partner, our spouse; serious illness strikes; we are injured in an accident; a relationship we had counted on disintegrates. These blows may be caused by our complacency--as when we take a relationship so much for granted that it dies for lack of attention. Or they may be the result of larger forces. We may also experience the deeper, spiritual struggles that Swedenborg speaks of. We may have a continual sense of despair about our own worth as a person--which is another way of saying we may despair of whether we can ever be "saved," in Christian terms. Along with this despair, there is often a sense that God is absent; that we are all alone in our struggles. Our very faith in the existence of God may falter, bringing with it a fear that our life is meaningless--that we have nothing to look forward to but physical decay and death. Perhaps we have read these familiar words too many times, and the images have lost their power. But with Hurricane Georges pounding our southern coast, they can come alive for us again in a terrible way. Hundreds of people have been experiencing David's imagery quite literally as they are swept away in the floods caused by the hurricane. Hundreds of poor souls have felt the waves of death swirling around them, and torrents of destruction have destroyed their houses, their cars, and their possessions. Though I have not experienced a hurricane firsthand, I have experienced some wild nor'easters here in New England. Still, the closest I've come physically to the experience of David's lines of poetry was when I was perhaps six or seven years old, and our family was visiting one of our favorite spots in Missouri: Johnson's Shut-Ins. This was a place where one of the local rivers went through a stretch of rocks and boulders, creating a whole series of rapids, small waterfalls, and pools that were great fun to play in. I remember one particular spot that had two or three small waterfalls in a row, with pools underneath them. We loved to slide down them one after another, and would spend all afternoon at it. Perhaps some of you have had a similar experience of being rescued from a frightening and dangerous situation by some Good Samaritan. There is nothing like the relief we feel when we are saved from what feels like certain destruction. Have you felt this on a spiritual level as well? Have you experienced emotional waves of death, and inner torrents of destruction threatening to smash and carry away everything you hold dear within your heart and mind? Most of us have felt this in some form--though we may not have thought if it in quite these images. This is the power of the literal meaning of the Bible: it gives us a concrete way to express our inner experience, so that we can grasp just what we are dealing with. For when we are in the middle of one of those periods of inner struggle, just as when we are being physically swept away by storm waters, all is crisis and confusion within us. We can't get our bearings; we are caught up in a flood of fear, depression, despair that overwhelms us so that we cannot think straight or see any way to save ourselves from the forces that we are caught up in. From our viewpoint, it looks as though we are being swept toward emotional and spiritual destruction. In psychological terms, we see ourselves as completely lost, without any hope of recovery. In spiritual terms, we despair that we can ever be saved from the downward pull of evil and destructive forces within and around us; we feel that we must be lost forever--that we will never experience the joy of heaven. This is the inner, spiritual experience that David's words point to. It is something we would rather not experience. And yet, our teachings tell us that this experience does help us in our spiritual growth. When we fear for our spiritual life, Swedenborg says, this is actually a good sign. It is a sign that we are not focused only on physical survival--which has no meaning beyond our lifetime here on earth--but that we are focused also on our spiritual survival and our spiritual life. Our very fear that we can never be salvaged as a person is a sign that we long for the higher, heavenly life that the Lord continually offers us. As we struggle with spiritual fear and despair, we gain something that we did not have before through losing something that conflicts with true spiritual living. What we lose is our sense of complacency, of having everything we need, of being sufficient unto ourselves for everything in this life. As long as we feel that we can handle on our own all that life may throw at us, we will make no progress toward God. But, like Hurricane Georges, the waves and torrents of our life's struggles make us realize that, no, we cannot handle things alone. When we feel that inner life and death struggle, we come to realize that if we are left to ourselves, we will be lost forever. Yet this realization can bring us a gain so much greater than the loss of our proud self-reliance. It can bring us to the point where, with a humble sense of our great need, we are ready to call on the Lord for help. Then we are ready for the Lord's powerful presence to rescue us and give us a new sense of the goodness and beauty of life. Then we know, not only from reading the Bible and listening to sermons, but from our own living experience, that the Lord is indeed a very present help in trouble. Amen.